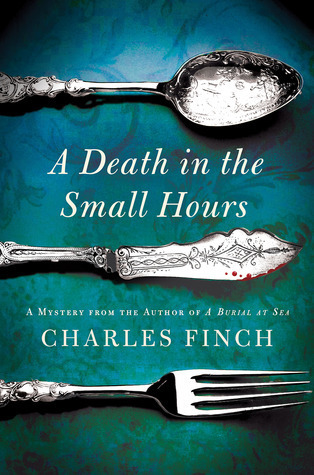 A Death in the Small Hours by Charles Finch is the sixth book in the Charles Lenox mystery series set in Victorian England. Charles Lenox is now a well-respected Member of Parliament, husband to Jane, absolutely besotted father of their infant daughter. When Charles is awarded the high honor of giving the opening speech for Parliament's next session, he welcomes the opportunity to publicize the reforms he recommends to alleviate widespread poverty. After announcement of his upcoming speech, he's swamped with visitors to his Grosvenor Square home. Realizing he won't get the peace he needs to concentrate and write his speech, he accepts the invitation to visit his uncle in the country, with his wife and baby of course. Charles' uncle Freddy welcomes the family warmly. Freddy's estate holds many happy memories for Charles, from childhood visits. Certain he will thrive and successfully write his speech in this country setting, Charles is eager to 'give back' to aid his uncle in any way. When Freddy tells Charles of a series of crimes that have unsettled the nearby village, Charles is eager to investigate. Charles really misses his days as a crime investigator, a vocation he had to set aside to serve Parliament. Investigating the crimes leads Charles on a few red-herring goose chases, but he eventually uncovers the deception motivating the incidents, and cleverly traps the culprits. How he solves the puzzle is interesting, yet greater enjoyment springs from Charles' love for the (mostly) peaceful countryside, lovely descriptions of his uncle's estate, and the relationships that deepen (or blossom) between friends and family during their stay. Sign into Goodreads to see if any of your friends have read A Death in the Small Hours.